Next Wednesday our community will join together at 9:00am for the annual Peace Assembly. We will wish each other peace and light during these short days, as we get ready to take some time away from our school community at the end of the calendar year. Every student will perform and the middle schoolers will lead our traditional candle lighting. This year, our Peace Assembly experience is inspired by the work of the artist and author Thomas Locker. We were moved to design a Locker theme and a series of experiences for Parker students because, in September, the school received the gift of an original painting by the artist. 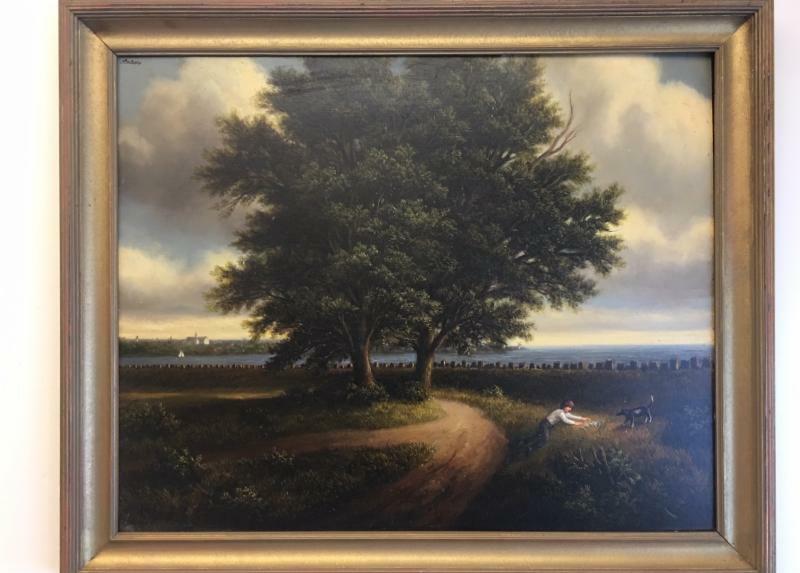 The painting, which was created as an illustration for the book The Boy Who Held Back the Sea (the framed painting above), now hangs in our library. It is a gift from Miriam Locker Hobson ‘02, a Parker graduate who is also the parent of a current pre K student, and Thomas Locker’s niece. Our assembly will be the culmination of a thematic learning project that included all students in the school. 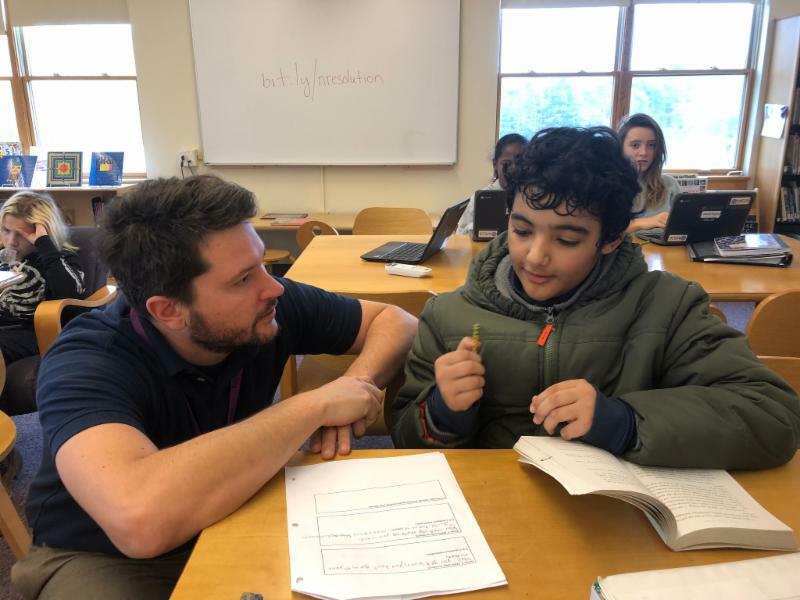 Thematic learning helps students to make connections, and also breaks down the silos between traditional fields, in ways that enrich learning and inspire creativity. 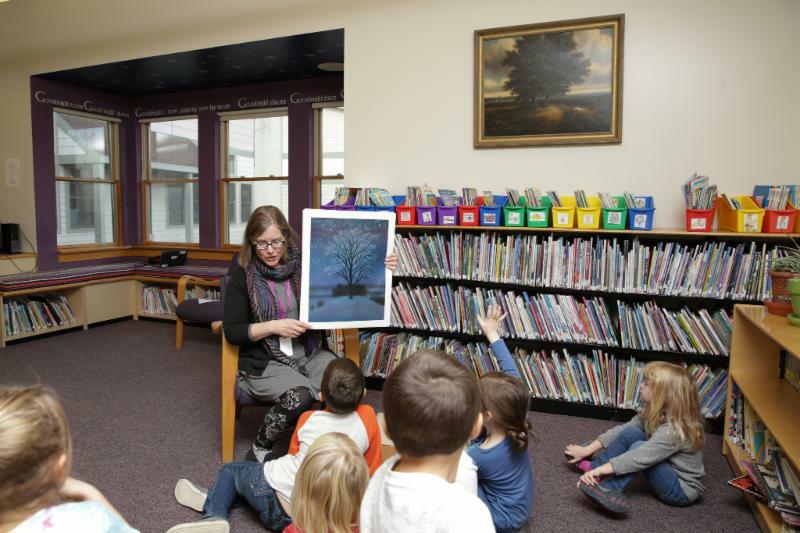 To make Locker the focus of our author and artist study, our students started their work in the library with librarian Laura Salisbury who taught one of Locker’s books, Sky Tree to the students. The “edition” of the book that Laura used was printed as a huge folio, and given to Miriam, by her uncle, when she was a young student, for use in one of her grade school classes. Like many of Locker’s books, Sky Tree focuses on the environment, showing the tree as a keystone member of its ecological community through the seasons. 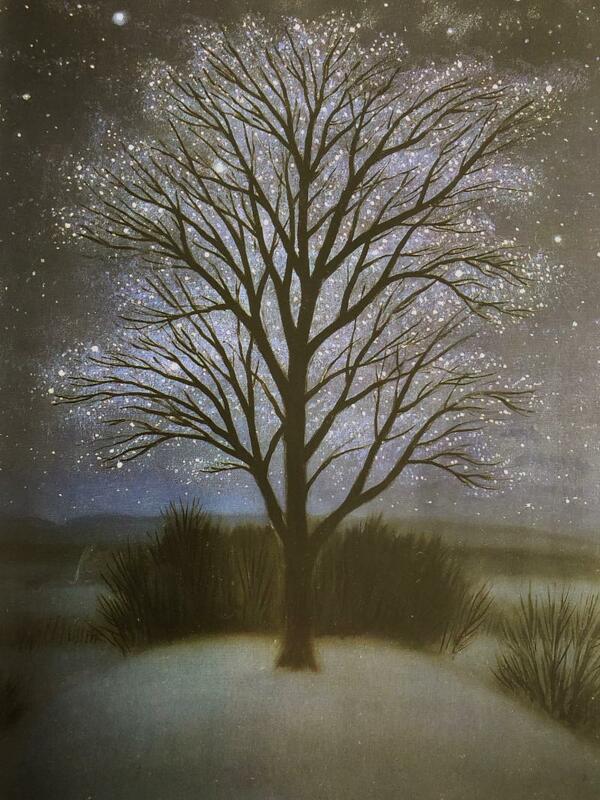 The book and illustrations were inspired by an actual tree that stands on the Hudson. Laura, the K-1 class, and the beautiful large format of Sky Tree. Reading a book is only a start to a deeper, active learning experience. Being asked to write, after studying a model text, focuses readers on language use, sequencing ideas, and metaphor, paving the way for analytical reading and writing in secondary school. Classroom teachers brought more Locker books and poetry into their rooms, and students became authors themselves. The writing tasks varied by age and classroom. Our youngest students made observations in Parker woods during autumn and, with their 4-5 buddies recording their lines, told the natural history story of how trees lose their leaves. The preK 4 were also inspired by leaves, and used one of Locker’s poems also, as their inspiration. They made prints and rubbings that illustrated acrostic poems composed with their 4-5 buddies. In the 2-3, students wrote haiku and free verse, inspired by Sky Tree, as well as Water Dance, another Locker book. Middle school students also examined Locker’s books as “mentor texts,” before writing their own children’s stories, to be shared with their K-3 buddies. The layers of learning deepened with this writing work because every student had an authentic audience to “publish” their finished work for. Student work was bound into books, and clean copies of poetry were illustrated. Middle schoolers printed their writing, read the books to their buddies, and together, they then drew an illustration for each story. Having an authentic audience, beyond just the teacher, deepens the learning experience because, from the start of the writing, students have to bear in mind who their audience is. Whether a student is three or thirteen, they must choose their words and images with care. Audiences honor finished work and inspire clarity in the writer. 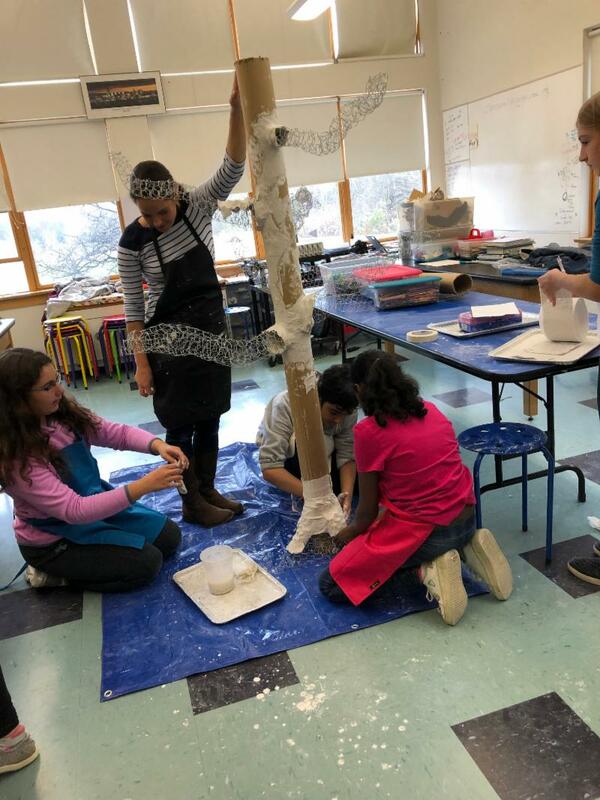 Middle school students work together to build Sky Tree. Handmade creatures will be displayed on Sky Tree. In music class, Sara used Sky Tree as the theme for the musical selections for the Peace Assembly. The students looked at the illustrations from the book and chose pieces were inspired by the tree. Many are about the changing seasons. Before each selection, the audience will see an illustration projected on the screen and hear a reading from the book. For this The singing will be accompanied by instrumental music as well. The experience came full circle as it returned to its roots in the visual arts, with teacher Claire Sherwood. 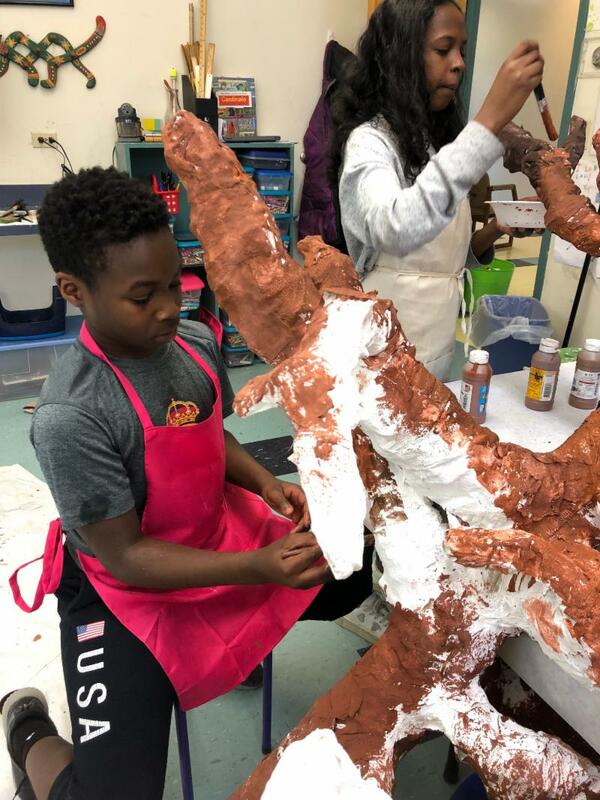 In her art classes, students created a three dimensional tree of wire and paper mache. 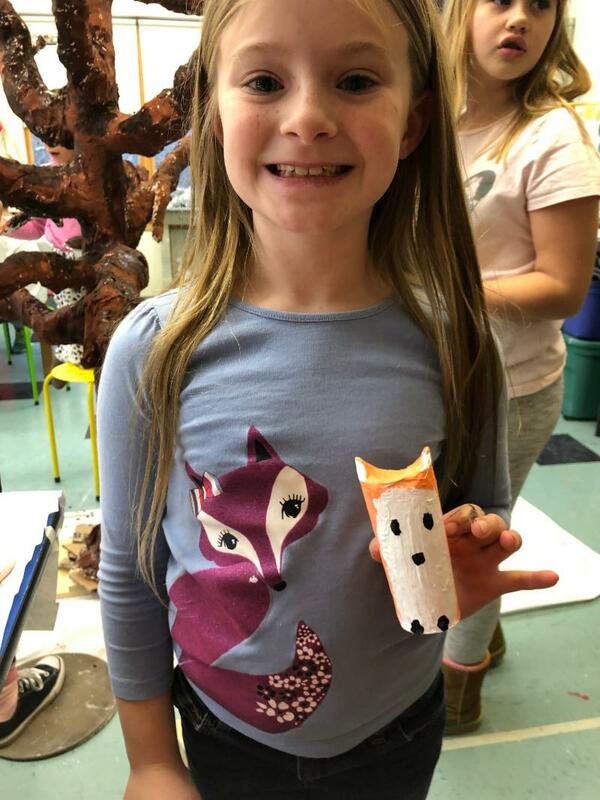 The tree will be installed in the lobby of the Discovery Center, and the installation will include dozens of forest creatures that live on and near the tree. Students and the audience will complete the final part of the installation at the assembly: The middle schoolers have been cutting a pile of leaves, out of paper. Everyone in the community who attends the assembly will have a chance to write a wish or a gratitude on a paper leaf. The older students will hang each leaf on on our “Parker Sky Tree.” to inspire and warm us in the new year. We are very grateful to Miriam and her family for this generous gift that we are proud to display in our library. 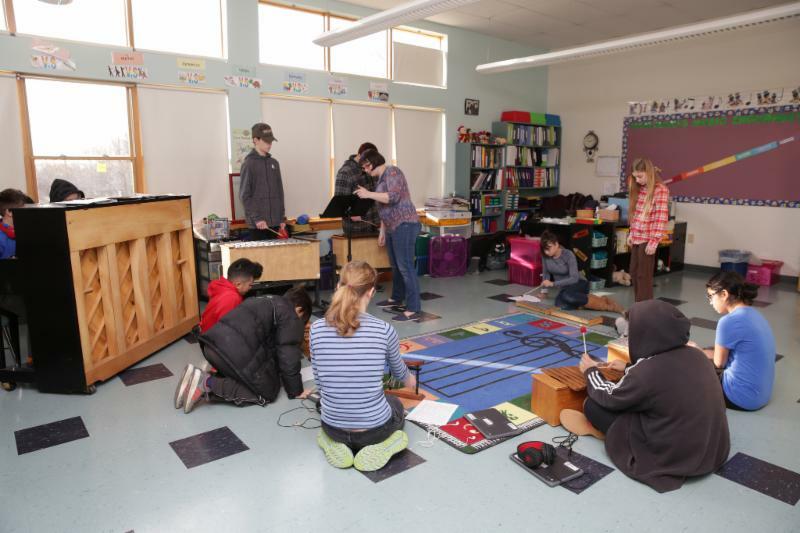 The creativity of the teachers as they embraced this whole school project is inspiring, as is the layers of learning that the students engaged in. We look forward to showing it all to you on Wednesday, December 19 starting at 9:00am.